Wow~I have been on a blogging break, and I didn't even plan it. I didn't have to cook. Yay!!! that live near us to help decorate this little tree in the kitchen. decorations, and they gave me a jump start to decorating for the holidays. Tartan tea cup and saucer with my collection of nutcrackers. in the living room, but the brick back is in the dining room. to display many collections during the year. on the wall is from the 'French Laundry' in Napa Valley. I saved the clothes pin they use as a napkin ring. When I travel, I usually find a tea towel to bring home. display this towel during the holiday. I found the small nutcrackers at the Dollar Tree. It's all beautiful, Betty. 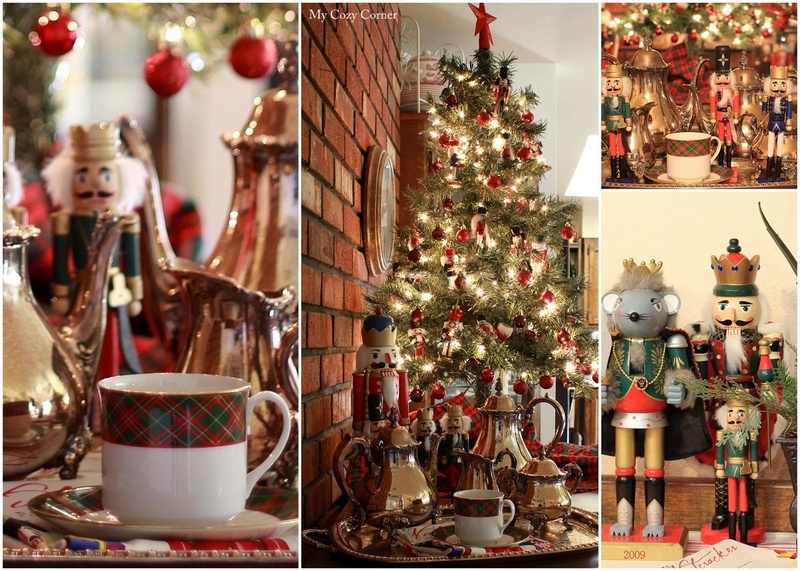 I love seeing your Nutcrackers, and the tartan and silver make excellent partners with the Nutcrackers. I wanted to pin the mosaic, but the link didn't work for me. It just gave me a blank screen. I just removed the pin it button. There is a save pin in the left corner. I hope it works. Thanks for visiting. So cute! Love all your decor ! Great job!! Love your Nutcracker collection. I am seeing tons of those come through the thrift shops, not entirely sure why. Beautiful Christmas arrangements! The Nutcracker reminds me of Tsaikovski... Happy Holiday Season! What a wonderful collection of nutcrackers an so beautifully displayed with their own tree and pretty tea tray. How lovely to have your granddaughters helping you to decorate your home for the holidays, this is how traditions are passed down through the generations making for wonderful family memories of good times spent together. Thank you for being a part of Mosaic Monday and sharing your Nutcrackers with us today. A beautiful collection of Nutcrackers, Betty. I do like the tartan pattern teacup, and your silver tea pot. How great to get together with family and have help decorating the tree. Such a lovely collection of Nutcrackers and you have them arranged so perfect with your silver. You are certainly ready for Christmas. Thanks for sharing. The tartan tea cup sure is pretty! And your collection of nutcrackers is beautiful! It's fun to find a few neat things at the Dollar tree. Holiday hugs! What a charming collection of nutcrackers! I'd love to own a nutcracker teapot. I enjoy seeing your nutcrackers and other lovely Christmas displays. The reflective lights from Christmas trees bring so much warmth to a home. I love seeing the reflection in your silver service. And wonderful to have help with the decorating! Merry Christmas! Betty, lovely collection. AND tartan teacup! I envy your red brick background. Wishing you a delightful December. Thanks for linking and sharing your sweet Nutcracker Themed tea time! Everything looks so very joyful! Hi! I just received my very first nutcrackers (From Sarah, at Hyacynths!) You have a wonderful collection - AND such a pretty tree! Merry Christmas!